Unsure what to expect? The book is packed with ideas and examples in just 50 easy-to-read pages. 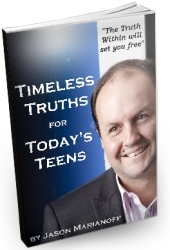 The majority of the content is transcribed from a speech given by Jason Marianoff to a group of teenagers. Although it's aimed at teenagers, it is suitable for all ages (young and old). Will You Master Money or Will Money Master You? How You Start is Less Important than What You Do Along the Way! What You Don’t Want Boosts Your Clarity About What You Do Want! The World is Ready and Waiting for You to Shine! Let Go of Your Excuses Not to Succeed by “Forgetting” Your Past! The World Depends on You Being Uniquely You… You are AMAZING! Click the "book cover" for your free copy (thanks to someone's kind generosity)!